Female artists dominated at the Grammy awards Sunday night, with the focus of "music's biggest night" firmly focused on the performance of women by performance. The Recording Academy – which has been trying to address criticism around the lack of diversity at its annual celebration of music – has made some strides when it comes to nominating more diverse musicians. It was on display Sunday, as the Grammys registered several historic wins for rap artists and saw female acts triumphing with two of the night's top trophies (album of the year, best new artist), as well as in categories including rap album, country album , R & B album and pop vocal album. Producers of this year's Grammy telecast chose to, for the most part, turn the show over to female artists, highlighting the talent of host Alicia Keys and honoring music icons like Dolly Parton, Diana Ross and Aretha Franklin. Then there was a noticeable boost in top-nominated female acts (including Kacey Musgraves, Janelle Monae, Cardi B, H.E.R., Dua Lipa and Brandi Carlile) performing – and commanding attention with their time on the stage. "I just wanted to say how honored I am to be nominated along with so many incredible female artists this year, because I guess this year we really stepped up," Dua Lipa quipped on winning best new artist, a clear retort to outgoing academy head Neil Portnow's infamous comments backstage at last year's telecast. That said, the show was not without mishap. Here's a round-up of some memorable moments from the night. Grammy TV producer Ken Ehrlich is just addicted to star-studded matchups and duets. Sometimes it really works, as with Camila Cabello's high-energy opening performance of Havana, featuring J. Balvin, Ricky Martin, Young Thug and Arturo Sandoval. But slamming together musical notables of different genres and generations or simply signing big names to perform another tribute does not always pay off (more on J. Lo later). 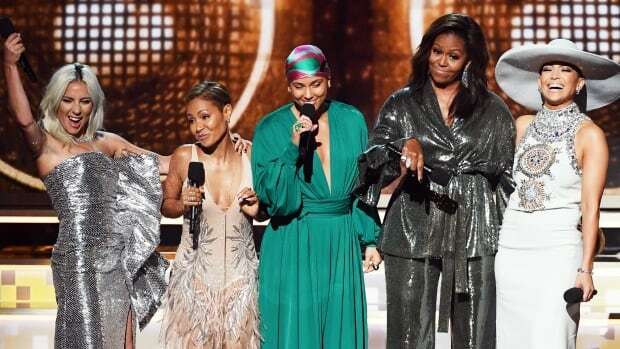 This helps kick things off, Keys shared her time on stage with some major names, inviting "sisters" Lady Gaga, Jada Pinkett Smith, Jennifer Lopez and – seemingly garnering one of the night's biggest and longest ovations – Michelle Obama. "Music has always helped me tell my story," Obama said. "Whether we like country or rap or rock, music helps us to share ourselves. It allows us to hear one another." In one of the night's surprise appearances, Grammy-and-Juno-snubbing hip hop star Drake was actually in the house to accept the Grammy when God's Plan won the trophy for the best rap song. "If there are people who have regular jobs that come out in the rain and snow, spending their hard-earned money to come to your shows, you do not need this right here, I promise you, you've already won," Drake told fellow artists from the stage after his win. But just when we thought maybe his beef with award shows had ended, the producers bluntly cut off his real-talk speech, sending the show to commercial at what they subsequently called a "natural pause" (with Drake apparently declining the offer to come back and finish his thoughts). Well Grammys, that's probably the last time you'll see Champagne Papi at your show. And speaking of no-shows, Childish Gambino (aka Donald Glover) made history with his blistering track This is America winning both the song of the year and the record of the year. Another historic win came when rapper Cardi B became the first solo female rapper ever to win the best rap album (for Invasion of Privacy). A decision that was maligned by many from the moment it was revealed was the Grammys' decision to have Jennifer Lopez lead the tribute to Motown. A major complaint was that the tribute to the label that brought the world's artists like Marvin Gaye, The Supremes, Glady Knight and Stevie Wonder, should come from a black artist. Though widely acknowledged for her phenomenal dancing, J.Lo has never been considered an incredibly strong vocalist, building a multi-song tribute around her (even with the help of Motown legend Smokey Robinson, Grammy host Keys and R & B singer-songwriter Ne- Yo) felt inexplicable to many in the audience. It's not surprising that the set, which seemed to channel her Las Vegas residency, earned a significant backlash on social media – especially when a tribute to Aretha Franklin later in the show appeared to get truncated to just one of the songs of Queen of Soul. When you land a 15-time Grammy-winner as a host, you want to make the most of it – and Grammy producers definitely showcased Keys as much as they could. She shared personal stories, offered upbeat optimism about the music industry and, delivered a terrific two-piano bit that showed that long musical medleys do not have to be stuffed with cameos to actually be enjoyable. And you do not think big moments just happen on stage, Canadian nominees Young Spirit brought the roar of the red carpet to a momentary halt and attracted everyone's attention with a Cree round dance. The minority government is unknown territory for P.E.I.